Information Technology (IT) is one of the fastest growing sectors no matter where in the world you are. LinkedIn found that IT dominated their top skill set for 2015, with SEO marketers, marketing campaign managers, and web developers ranking in the top ten globally. Regardless of whether a company is large with hundreds of employees or just a one-person operation, many of these professionals are choosing to operate out of an at-home office rather than a traditional office setting. If you are one of those professionals and beginning your journey of working from home, taking the time to thoughtfully design your at-home office can make all the difference when it comes to focus and inspiration. With a few tips from Modernize, your at-home office will help you optimize your productivity every day. Hands down the most important decision you will make in regards to your home office is location. Having a designated work area that is away from the general commotion of a home is imperative. If a separate room is available, then absolutely make use of it. However, if your home is not conducive to this, then any nook or corner will more than suffice. Regardless of whether your office is behind a closed door or not, be sure to establish boundaries with yourself and your family members about how much interaction is appropriate while you are working. Virtually all jobs rely on the internet these days, but none more so than IT professionals. If your home’s wifi signal is stronger in certain areas, make sure your office fits within that parameter or move your router to accommodate your business needs. When deciding on your desk, consider how much space you will need to properly fit all of the equipment and supplies you need on a daily basis, like computer monitors and keyboards. Although you want to make sure that you have enough room, you also don’t want to overestimate the space you need, since open areas tend to collect clutter quickly. If you are willing to branch out a bit, consider a standing desk. 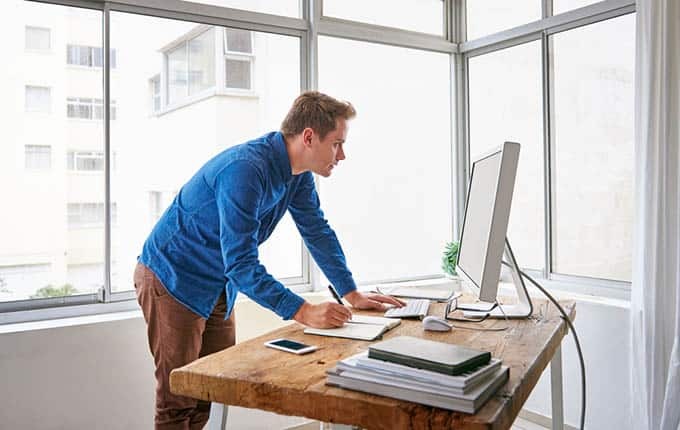 Science has shown that standing at a desk, rather than sitting, can positively impact your healthy in a myriad of ways, including reducing your risk of obesity, Type 2 Diabetes, and certain cancers. If you choose this option, be sure to pair it with a tall chair or stool for those brief moments when you need a standing reprieve. If a traditional desk is more your speed, then choosing a high-quality ergonomic chair is essential. No one performs their best with an aching back or neck, and not every chair is ideal for every body type, so test drive a chair at your local office supply store and find the one that fits you best. If you are thinking that you are going to have to sacrifice style for comfort, you couldn’t be more wrong! Ergonomic chairs now come in such a wide variety of designs and colors that you are certain to find one that naturally matches your aesthetic. One of the main perks of having an at-home office is that it gets to be a reflection of your personal tastes and needs. Pick rugs, artwork, wall color, and plants that make you feel comfortable and empowered. Don’t forget to find aesthetically pleasing storage solutions for your layout, too! Business executives lose six weeks a year simply looking for lost items and information, so make the most of your time and keep organized. By considering your needs and your own personal taste, you’ll have an at-home office that keeps you productive and inspired for years to come! Author Bio: Bryn Huntpalmer is a mother of two young children living in Austin, Texas where she currently works as an editor and writer for Modernize.com with the goal of empowering homeowners with the expert guidance and educational tools they need to take on big home projects with confidence.